Everyone knows that brushing your teeth and flossing regularly helps your oral health. However, you can also eat certain foods to keep your teeth and gums healthy, says Dr. Steven Lin, a dentist from Australia. While his statement is shocking, it could be the reason why people who religiously follow their dentist’s advice are still at risk for tooth decay. Despite brushing and flossing, dental problems will still occur if you’re lacking some nutrients. Dr. Lin shared that the following four vitamins can help keep your teeth healthy: A, D, K2, and E. Individuals who suffer from dental issues might not be getting enough of these vitamins in their daily diet. If you aren’t getting enough vitamin A, your mouth will be unable to make enough saliva which helps eliminate harmful bacteria, says Dr. Lin. The dentist shared, “When you aren’t getting enough vitamin A, your saliva glands can’t do their job and it can contribute to pits on the surface of your enamel.” Food rich in vitamin A includes carrots, dairy products, eggs, and yellow or dark vegetables. As for vitamin D, it is required to keep your bones and teeth strong. Dr. Lin added that the vitamin has other benefits. “There’s actually a little immune system within your teeth, called your odontoblasts, which needs vitamin D to be activated. Your odontoblasts are the cells of your teeth that produce dentin and are vital to tooth regeneration,” he commented. These foods are rich in vitamin D: fatty fish, mushrooms, and some dairy products. Vitamin E is an antioxidant and it helps keep the levels of bacteria in your mouth under control. It also regulates the microbiome in your mouth, which is home to all sorts of bacteria, fungi, and viruses. You can get vitamin E by eating broccoli, spinach, and nuts. If you’re not getting enough vitamin K2, your calcium supplements are useless. He explained, “Vitamin K2 is like the traffic cop for your calcium, telling it where and when to go.” Individuals with K2 deficiencies need calcium, but it goes to their kidneys and arteries instead of their teeth. Vitamin K2-rich foods include butter, eggs, salami, and soft cheeses. Apples – Since this fruit has a high water content, if you eat apples you can stimulate saliva production in your mouth. The fiber in apples also stimulates the gums and is a mild astringent that can help make your teeth brighter. Dairy — Eating the right kind of dairy products, such as those that don’t contain antibiotics, hormones, and other chemicals, will ensure that your teeth gets the calcium it needs to stay strong. Drink raw milk and kefir and eat yogurt to boost oral health. Coconut – Try coconut oil pulling, a great oral detoxification process. 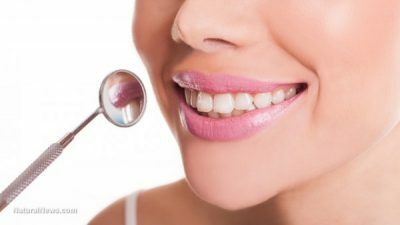 Doing this removes toxins in your mouth and creates a cleaner environment in your mouth to prevent cavities and disease. Just swish a tablespoon of coconut oil in your mouth for 20 minutes. Once you’re done, spit out the oil but don’t spit in your sink (it can clog your drains) or swallow (you might re-absorb the toxins). Leafy greens — Rich in vitamins and minerals, leafy greens are low in calories. Eat some collard greens, kale, spinach, or Swiss chard to keep cavities away. Nuts — Because nuts are full of vitamins and minerals that are good for your teeth, they’re one of the healthiest snacks that you can enjoy. Chewing nuts also helps saliva production to keep your mouth cleaner.